Click here to order your copy of RV78, which features Mark Beyer, Veijö Rönkkönen, Howard Finster, Alexis Lippstreu, Israele, Xico Nico and unsung sand sculptors. Out in August, RV79 will feature Alex Grey, Josef Karl Radler, Ferdinand Cooper, Ernst Kolb, Hiroyuki Doi and Patrick Joyce. 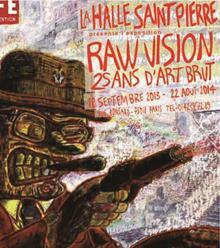 From September 18, 2013 – August 22, 2014, Halle Saint Pierre celebrates 25 years of Raw Vision. Featuring classical works of Art Brut, new discoveries, photos of extraordinary visionary environments and over 60 artists including Nek Chand, Henry Darger, Sam Doyle, Howard Finster, Alex Grey, Tom Duncan, Michel Nedjar and many others. 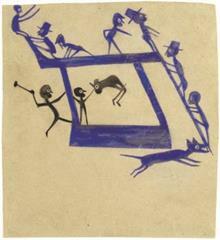 At AFAM until September 22, 2013, more than 60 drawings by the iconic self-taught Alabama artist are presented in Bill Traylor: Drawings from the Collections of the High Museum of Art and the Montgomery Museum of Fine Arts. Raw Erotica book out now! A survey of highly personal imagery by outsider and self-taught artists reflecting their innermost desires and feelings. Artists include Adolf Wölfi, Mose Tolliver, Henry Speller, Carl Genzel, Ody Saban, Steve Ashby, Roy Ferdinand, Harold Jennings, Johann Hauser, Malcolm McKesson, Joe Coleman and many more.